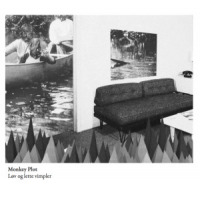 The title of this debut album from young Norwegian trio Monkey Plot, Løv og lette vimpler ("leaves and light streamers" in Norwegian) suggests a glimpse into its impressive range. The musical vocabulary of these musiciansacoustic guitarist Christian Skår Winther, double bassist Magnus Skavhaug Nergaard (both members of the noisy, in-your-face punk-jazz trio Ich Bin N!ntendo) and drummer Jan Martin Gismervik (himself a member of the experimental duo PGA)refuses to be defined by genres. It is associated with assorted inspirations such as Nordic folk music, such lyrical songwriters as Nick Drake, experimental sonic explorers, noise, and free improvisation. The album was recorded in Stavanger, in the living room of Norwegian free jazz pioneer Frode Gjerstad. Gjerstad succeeded in capturing the trio's simple, acoustic and intimate sound, and the free-spirited structure of its pieces. The first, "Monsun," blends organic guitar improvisation that references the ECM recordings of Ralph Towner, and a cinematic drone soundscape and reserved sonic explorations, all kept in a delicate balance. The following pieces keep playing with these elements, emphasizing one or more at the same time. "I Don't Need Pen Or Ink" focuses on the inventive sonic approach of the trio that embraces all sounds. The guitar sounds like a Far- Eastern string instrument, while the drums as sketch a soundtrack for an intense ritual and the bass adds more mysterious sounds. "Å Gjete Vinden" blossoms from similar, even lighter sonic research, to a beautiful, lyrical melody. "Even Before Napoleon" and "I Like To sleep" sound like dramatic, ancient folk melodies, even dances. "Twelve Days Of Christmas" has a much darker and threatening, cinematic sonic quality, distant from any reference to a festive holiday atmosphere. Monkey Plot manages to find a remarkable balance between the experimental, the melodic and lyrical, and manages also to mix these elements in an organic manner. Track Listing: Monsun; How Small Is The Universe? ; I Don't Need Pen Or Ink; Å Gjete Vinden; Nippon Gaki; Even Before Napoleon; Meet The Fishpeople (Revisited); Twelve Days Of Christmas; I Like To Sleep. Personnel: Christian Skår Winther: acoustic guitar; Magnus Skavhaug Nergaard: double bass; Jan Martin Gismervik: drums and percussion.